When I took in The Perfect Storm during the summer of 2000, I enjoyed the film except for one annoying factor: a mildly-elderly woman in the row behind me who almost constantly uttered the phrase "uh-oh" during the picture. "Almost constantly" is not an exaggeration, either; two minutes never passed without an "uh-oh". Storm clouds on the horizon? "Uh-oh". Weatherman discusses the storm's potential? "Uh-oh". Marky Mark orders some chowder? "Uh-oh". This woman was completely out of control. The loud storm scenes slightly covered her vocalizations, but she seemed to unconsciously react to them and often muttered more loudly at those times. I don't think the old bag did any of these on purpose, and frankly, I believe she may have lost use of some of her mental faculties - which was the only reason I didn't tell her to pipe down. I did shoot her some surly looks that she was too oblivious to notice. Now that I've seen the movie a second time, I feel as though I should track down the "Uh-oh Woman" and thank her. Frankly, I think I only liked the film when I saw it theatrically due to her behavior; she distracted me from the many flaws found in the product at hand. Without the aggravation she offered, I was better able to see all of the picture's problems and find much more fault with it. I won't call The Perfect Storm a bad movie, for it's not. Actually, it's a decent little action piece that works pretty well at times. However, I think it's the kind of film that only creates a positive impression during its first viewing, for once I knew all of its tricks, it packed a much smaller punch. The film introduces us to a crew of swordfishermen from Gloucester, Massachusetts who are enduring a bad streak at sea; their recent hauls have been poor, so they push their luck by venturing out farther than usual. They do so but run into serious trouble on the voyage home due to the development of a nasty patch of weather. The film documents their experiences and mainly focuses on their attempts to navigate through this "perfect storm". Many of the moments in which we watch the crew of the Andrea Gail battle the elements are well-executed and exciting. The technical effects are very convincing; they make the entire enterprise feel realistic. Unfortunately, I felt the action scenes offered less impact than they should because I simply didn't care much about the characters. This is through no faults of the actual personages, but I felt the participants were not given any real personalities. The film features quite a few prominent roles, but none of them seem like anything more than bland stereotypes, and they receive almost no exposition to help us feel more interest in them. Frankly, it seems like Storm tries to get by on nothing more than the appeal of the actors, which is actually a smart choice in some ways, since the film features some talented performers. George Clooney is strong as usual in the main role of ship captain Billy Tyne, and Mark Wahlberg provides able support as young fisherman Bobby Shatford. The unfortunate aspect of their pairing is that it reminded me of their prior effort together, 1999's Three Kings. That was a much better film and it featured more compelling characters, which makes the work here seem less full and interesting. Though the actors try their best, there's simply no core to these characters onto which they can grab; the writing provides them with no support and some of the exposition seems nonsensical at times. For example, "Murph" (John C. Reilly) and "Sully" (William Fichtner) are at each others' throats even before the expedition starts because…? The film offers no explanation why these two hate each other so much, and this makes the entire situation feel contrived; they loathe each other just because the movie wanted some artificially-created drama, and it didn't work for me. 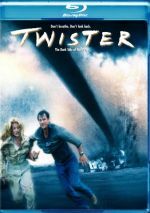 Granted, weak characterizations are not unusual in this sort of "disaster" movie, and some may note that I really liked Twister, even though it offered more superficial personae than those we find in Storm. This is true, but two differences occur. First, Twister didn't focus as strongly on the emotional/personal component of its story. Storm is a product of the post-Titanic era of filmmaking in which a tragically romantic element has to appear. It worked for James Cameron's hit, but it doesn't add anything here. The other difference is that while Twister's action sequences were quite effective, those of Storm are merely pretty good. Wolfgang Petersen has always shown himself to be a solid director but I feel he lacks any substantial style or flair; his films have a "workmanlike" tone to them that means they're well-done but never special. Storm fits perfectly into that mold; it creates some moderately powerful scenes but it never threatens to become anything extraordinary. Frankly, I think Storm would have been a more effective film had it concentrated on a subject other than these fishermen. It includes some segments in which Coast Guard rescue crews go to work, and these are the best parts of the movie. While the fishermen are decent subjects, the Coast Guard crews seem more worthy of attention, since they routinely risk their lives to help others. Their peripheral involvement in Storm is compelling but insufficient, and had the movie spent more time with them, it might have been more worthwhile. As it stands, The Perfect Storm functions as a decent action film but not one that really rocked my boat. It provides a moderately exciting ride while it lasts, but I didn't think anything about it stood out as exceptional or particularly noteworthy. 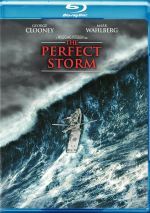 The Perfect Storm appears in an aspect ratio of approximately 2.35:1 on this Blu-ray Disc. Though not stellar, the transfer was usually satisfying. Early on, however, I didn’t feel optimistic about the presentation. Much of the film’s first act seemed slightly soft and bland, and a few more sequences like that cropped up later in the flick. However, after that lackluster beginning, the movie turned more concise and defined – enough so that my early qualms largely disappeared. I noticed no issues with jagged edges or shimmering, and edge haloes failed to appear. Source flaws were also non-existent. Although Storm used a pretty restricted palette, the hues seemed clear and accurate at all times and never showed any signs of bleeding or noise. The colors appeared natural and were solid within the production design. Except for the handful of murky scenes, black levels seemed similarly strong, and shadow detail was good. The occasional weak sequences made this a “B” transfer. As for the Dolby TrueHD 5.1 soundtrack, it provided the active environment I expected from a film such as this. Of course, the activity levels mostly came to life during the storm sequences, and the soundfield did become quite immersive on those occasions. Since the majority of the movie depicted stormy sequences, that meant a lot of wind and water whipping around us. The track used the five channels to good advantage and created an involving soundscape. Effects were the highlight, and they delivered a good impact. I thought those elements demonstrated nice clarity and range for the most part. However, I felt bass response could’ve been a little stronger, as the track didn’t pack quite as great a punch as I expected. Still, that was nitpicking; the audio was usually impressive and effective. 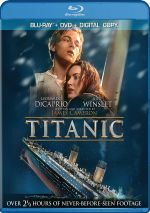 How does the Blu-ray compare to the original DVD from 2000? The lossless audio showed more bite and power, while the visuals looked tighter and smoother. This became a nice step up in quality. When we head to the set’s extras, we start with three separate audio commentaries. The first comes from director Wolfgang Petersen, who is joined by disc producer J.M. Kenney. Kenney adds a little information of his own, but he mainly functions as interviewer and he helps spark Petersen's memory and makes sure a variety of subjects are covered. Not that he has to do much in this regard, as Petersen proves to be a pretty chatty participant. As with Petersen's commentary for Air Force One, he devotes quite a lot of time to a discussion of the visual effects, but he doesn't focus exclusively on that subject. Petersen also delves into a variety of production issues such as story development and working with the actors; if you want to know who vomited the most, this is the commentary for you! I most enjoyed the segments in which Petersen mentions the involvement and reactions of the real-life counterparts; these added a nice touch to his track. Ultimately, I thought this was a good track that merits a listen. Although Petersen mentioned a lot of information about the visual effects, a more in-depth discussion occurs on the second commentary. This one comes from visual effects supervisor Stefen Fangmeier and visual effects producer Helen Elswit and almost completely sticks to technical details. To Petersen's credit, he covered so much of the information is such a complete manner that a lot of the second track's information seemed redundant to me; I already heard a lot of it from the director. In any case, the technical commentary provides a nice look at how this effects-intensive movie was created; it's the least-compelling of the three tracks, but it's worth a screening for those who like to know more about technical details. Easily the best of the three commentaries is the final one which comes solely from author Sebastian Junger. Whereas the first two tracks focused strongly on technical issues, Junger's discussion features virtually no information on that subject since it's not his domain. Instead, Junger provides a terrific description of the truth behind the tale. He relates a wealth of data about where the story is truly factual and where it takes creative liberties. He also lets us know the general reality of the lives led by folks in the fishing profession and his discussion really adds a lot of depth and humanity to the subject; it's a very solid and compelling commentary. Next we find a variety of video programs. First up is an HBO First Look special about The Perfect Storm. This show lasts 19 minutes and 55 seconds and provides a surprisingly compelling look at the making of the film. Normally these shows offer little more than glorified promotional opportunities, and while there's no question that "First Look" tries to entice you to see Storm, it nonetheless features a lot of useful information about how the movie was created. As with most documentaries, "First Look" combines interviews with cast and crew plus snippets from the movie and shots from the set. We also get a few interview clips from actual Gloucester residents, including Linda Greenlaw (played by Mary Elizabeth Mastrantonio in the film) and some relatives of Bobby Shatford. The program communicates a lot of data on different subjects, from the reality of the story to what it was like for the cast to the nitty gritty of the special effects. The show should have been longer and more detailed, but as it stands, I found the piece to be quite satisfying. Witnesses to the Storm provides four minutes, 32 seconds of interviews with real-life folks who have experience with the scenarios behind the film. We hear from Richard Haworth (a former captain of the Andrea Gail), Vito Calomo (executive director of the Gloucester Fisheries Commission), Joe Garland (“author, historian, Gloucester resident”), Jay Gustaferro ("commercial fisherman, surfer"), and Jack Foot (Gloucester police officer). In addition to their interview snippets, we see some videotaped footage of various storms, some of which was taken from boats such as the Hannah Boden. The program's too short to offer a whole lot of information, but I thought it was a compelling look at the reality of the situation. Creating an Emotion, the final video program, gives us a four-minute and 14-second look at how composer James Horner worked on Storm. It combines interview clips with Horner plus movie snippets and some nice shots of the score writer at work. It's a short but interesting look at one of today's most successful composers. ”Yours Forever” Photo Montage presents a series of stills from the movie accompanied by John Mellencamp's theme song. Actually, we get additional audio as well; the piece intersperses dialogue from the film between Mellencamp's lyrics. All of the photos in this four minute and five seconds piece are from the film itself; we find no promotional or "behind the scenes" images here. I like Mellencamp, but this program did little for me; it would have been of more value if the song had played uninterrupted, but the dialogue snippets became annoying. Related to this is the Soundtrack Promo, which is exactly what the title implies. The 15-second piece touts the soundtrack and that's it. Pretty lame! Another promotional element appears as well in the form of the movie's theatrical trailer. What does the Blu-ray lose from the DVD? It drops galleries for concept art and storyboards as well as “Cast and Crew” info and DVD-ROM components. The Perfect Storm takes on an interesting subject but only achieves moderate success in it coverage of that topic. The movie contains some pretty exciting action sequences but is much less compelling when it focuses on its lifelessly presented characters; despite the presence of a solid cast, the participants are less than interesting. The Blu-ray provides good picture, strong audio and an informative set of supplements. I’m not wild about the movie but the Blu-ray offers a solid product.